Here in the Greater Houston area, it is essential to have a comfortable living and working environment, especially with our hot humid climate. Clear the Air can provide service for any need relating to central air conditioning for your home or office. 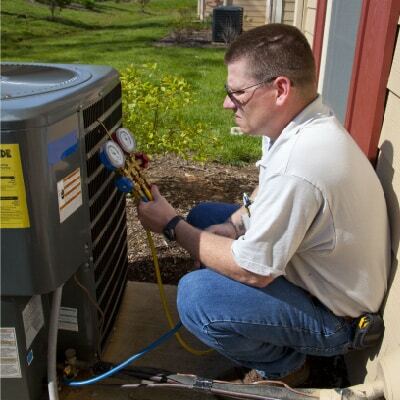 Our professional installers can install just about any central AC unit of any make or model and we also supply Trane air conditioners, which is a leading brand name in the air conditioning industry. With Locations in Friendswood and Pearland we provide AC Replacement Options and Air Conditioning Repairs in League City TX, South Houston, Pasadena, Deer Park, Clear Lake, League City, Sugarland, Missouri City, Galveston, Webster and more. View our service area here. Like a refrigerator, an air conditioner uses a heat transfer process to extract heat energy from the air and then replaces it with cooler air. The air is also moisture during this process. What keeps us cool is the drier air the AC produces. For instance, sweat that evaporates from our skin is like our own heat transfer process. When the air is dry, the more efficient the evaporation process becomes. Since Houston has such high humidity, drier air produced by an AC is more effective. Today, homes and commercial buildings use central air conditioning to heat, cool, ventilate the entire living or work space. Air that flows through a building’s duct work is filtered and ventilated and an automatic temperature control unit determines when to cool things off or heat things up. In Houston, central AC equipment is used frequently, so it is important to select the right unit that will provide comfort as well as energy efficiency. Our expert technicians have the qualifications to assist you in finding the right unit for your home or office. To find some good basic information on selecting the right AC unit, check with the U.S. Department of Energy. In addition, the ACEEE has good information on choosing an AC, reducing AC costs and finding a good contractor, such as Clear the Air LLC.